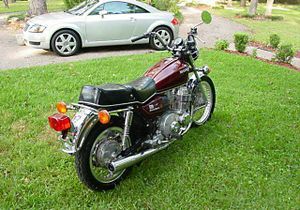 The Honda CB750A is a motorcycle produced by Honda from 1976 to 1978. 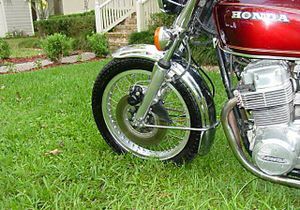 If the idea of a motorcycle with automatic transmission crops up from time to time, it was in the 1970s that it enjoyed its greatest vogue. 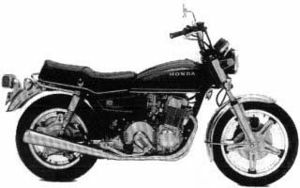 At that time, Honda was well into a "safety" mode, and obviously saw this as one way towards achieving a sensible motorcycle. The world's biggest two-wheeler manufacturer tried to apply the same formula to its motorbikes. 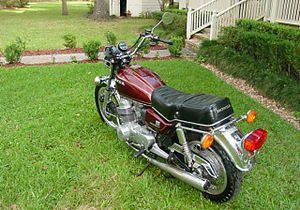 The Honda CB750A Hondamatic (lovingly called the "Dogamatic" by Honda service technicians) is a motorcycle that features a wet sump, torque converter, and parking brake, and has no clutch. 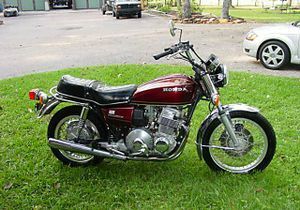 Made by Honda from 1975 to 1978, it was designed to appeal to beginners and people who otherwise wouldn't want a motorcycle. 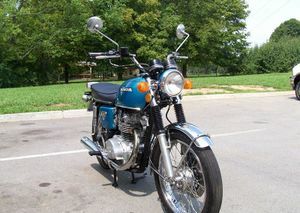 This 750 had nothing in common technically with the first Honda automatic, the M80 scooter of 1960, but followed the principles laid down by the Civic auto three years earlier. It wasn't an automatic gearbox but a torque-convener fluid coupling, which allowed just two speeds to be used -one for town or mountain use, the other for the highway (chosen by a selector lever; no clutch lever was needed). It wasn't a bad machine to ride. Unfortunately, it turned out too heavy, and its performance was no more than modest since the transmission docked the normally lively four-cylinder engine of nearly 20 horsepower. 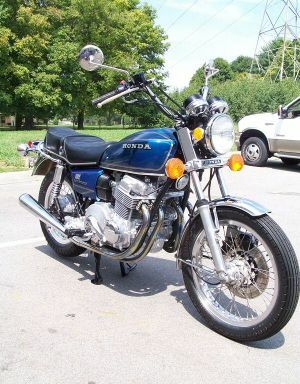 The 750 never found the appreciative clientèle Honda had believed would come forward , and production was halted in 1978: most of the CB750A automatics had been shipped to the United States. 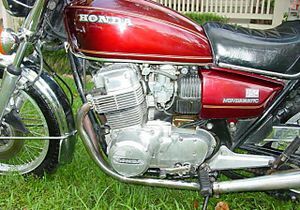 This washout didn't prevent Honda from trying again, this time with a 400cc automatic, whose sales were somewhat less disastrous. 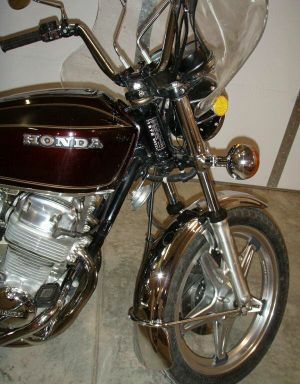 The CB750A Hondamatic 750 was sold in 1975 in Canada -- one year before it was offered in the USA. It was available in one of two colors: Muscat Green Metallic or Candy Antares Red. The exhaust system was a 4-into-1. The bike had wire spoke wheels with aluminum rims. The transmission was a 2-speed with a fluid torque converter. 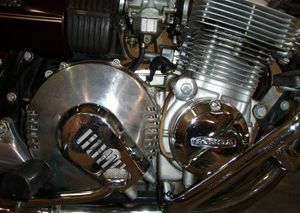 The engine was a 736cc SOHC 2-valve air-cooled inline 4 cylinder with a chain drive. 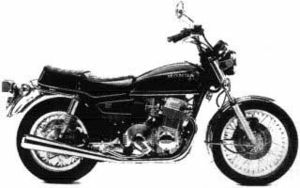 The serial number began CB750A-6000001. 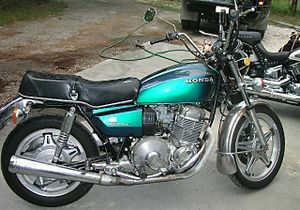 The CB750A'76 Hondamatic 750 was introduced into the USA in 1976 but the Hondamatic had been sold in Canada in 1975. It was available in one of two colors: Muscat Green Metallic or Candy Antares Red. The exhaust system was a 4-into-1. The bike had wire spoke wheels with aluminum rims. The transmission was a 2- speed with a fluid torque converter. 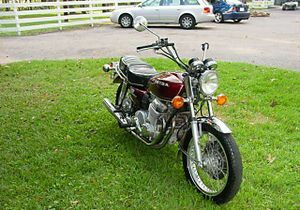 The engine was a 736cc SOHC 2-valve air-cooled inline 4 cylinder with a chain drive. 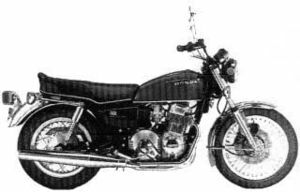 The serial number began CB750A-7000001. The 76 did not have stripes on the tank or side covers. 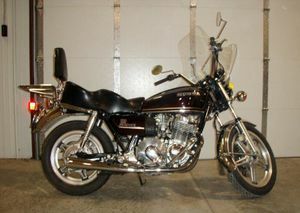 Mirrors are shorter than normal CB750K's. The control wires go through the handle bars on this year (I assume 75 also). 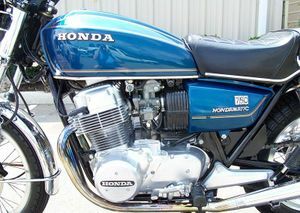 The CB750A'77 Hondamatic 750 was sold in 1977 in one of two colors: Candy Sword Blue or Candy Presto Red. The exhaust was now a 4-into-2. 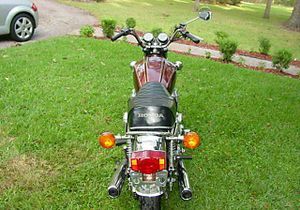 The gas tank and side covers had gold pinstripes. The bike had wire spoke wheels with aluminum rims. The transmission was a 2-speed with a fluid torque converter. 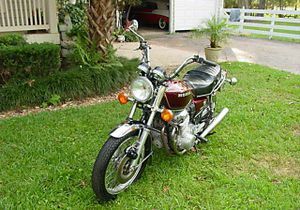 The engine was a 736cc SOHC 2-valve air-cooled inline 4 cylinder with a chain drive. 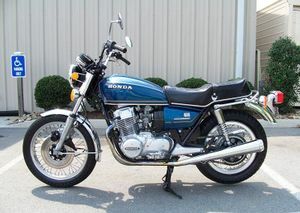 The serial number began CB750A-7100001. 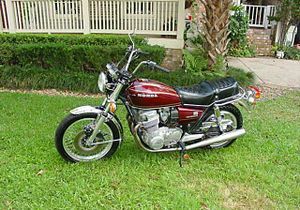 The CB750A'78 Hondamatic 750 was sold in 1978 in one of two colors: Candy Alpha Red or Candy Polaris Blue. 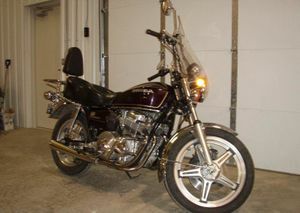 The bike had comstar wheels. 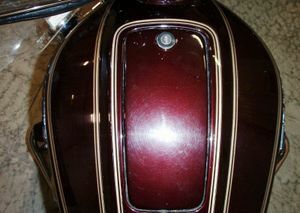 The gas tank and side covers had gold pinstripes. The exhaust was a 4-into-2. The transmission was a 2-speed with a fluid torque converter. 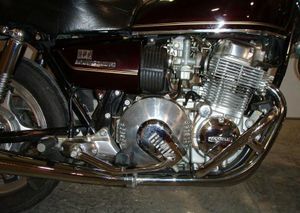 The engine was a 736cc SOHC 2-valve air-cooled inline 4 cylinder with a chain drive. 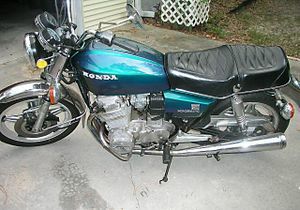 The serial number began CB750A-7200001. This page was last edited on 28 November 2010, at 20:53.